Miranda Kenneally’s Hundred Oaks series is one of my favorites. It’s full of strong, intelligent, admirable female protagonists and exciting, rewarding, and well-paced plots. There’s not a single one that I haven’t liked. I love that all of the stories are set in the same town, too, so that we see some of the characters from previous books, allowing us to check in on old friends. There are currently six published, with the 7th coming out this summer (side note: while I think it would work best if read in order, each book is its own stand alone story, so you can read them out of order). 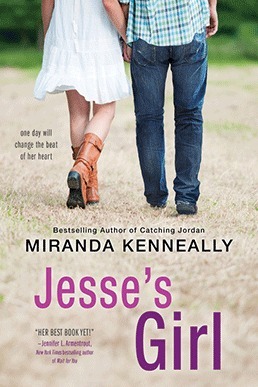 While I have liked them all, I can say that Jesse’s Girl, the 6th book in the series, is my absolute favorite of them all (probably because my love of stories involving normal people/famous people romance is real). It’s a slight departure in that the main character isn’t sporty, but it’s classic Hundred Oaks in every other way. In Jesse’s Girl, we get the story of Maya and Jesse. Maya’s a 17 year-old in high school, and when she says she wants to be a rock star when she grows up she’s assigned to Jesse, Nashville’s current teen music heartthrob, for a career shadow day. Maya and Jesse both agree to this shadow day, but neither one of them are real excited about it. As they spend time together, though, they see the potential for a friendship and more. Jesse helps Maya step out of a bad music situation she’s been in and embrace a more positive future in music, and she soars. This is a surprisingly realistic and very well written story despite the improbability of this situation actually happening. Because of some content, I’d recommend Jesse’s Girl (and the rest of the Hundred Oaks books) for 9th grade and up. Click here to find it on Amazon, or look or it at your favorite bookseller! Tamara Ireland Stone’s Every Last Word completely caught me by surprise. I’d thought the synopsis sounded good when I picked it to read, and I’ve always loved novels that incorporate poetry into the story, but I wasn’t prepared for how great this book really is. Sixteen year-old Samantha suffers from Purely Obsessional OCD, which she somehow keeps hidden from her group of friends, who would rip her apart and kick her solidly out of the popular social circle at any hint of something out of the ordinary. When Sam meets a new and definitely unpopular friend, Caroline, she also keeps that friendship hidden… especially when Caroline introduces her to a secret poetry club that meets in their school.It’s in this poetry club that Sam discovers the therapeutic value of writing. She also meets a few other friends, like the talented and cute musician, AJ. Sam’s confidence grows and healing begins and romance blooms in this truly beautifully written story. 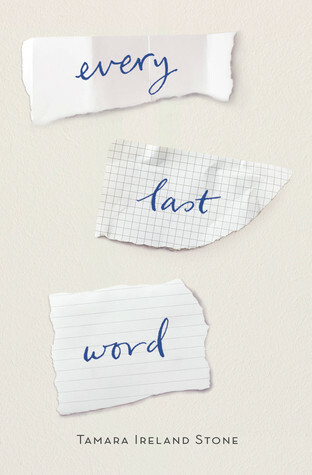 The Kirkus Review of Every Last Word said it’s “Clueless meets Dead Poets Society with a whopping final twist,” and I couldn’t agree more, which is probably why I liked it so much. Check out Every Last Word on Amazon or at your favorite bookseller!